It must be a total hole. Oh come on. It is a Bosch after all. Seems to me that any empty building in the UK in the past decade has been converted to flats. It's to give you the impression of effortless cleaning type chrome lined cooking without showing you the kitchen? Only a knob would buy it! It shows how poor we have become when people are expected to want to live in the corner of an old pub. Perhaps they would like to send their kids to the Wellington School! Arguably better value. Whenyou at how some period homes have all ended up as small flats you have to wonder why anyone thinks we are wealthier in property terms atall. When you see a small terrace built as a 'fishermans cottage' on the deeds, is now a London commuters £400k home near the station, you know it has all gone wrong. Who cares what it looks like anyway. It's not for living in, well not by the purchaser. Is BTL ruining your neighbour hood? Well I can confirm that Wellington School is excellent value. No contempary luxury apartments, please give these places their proper title. ie they have left the pub sign on the front. "This superb former inn has been cleverly converted into 11 one and two bedroom apartments, great effort having been made to retain much of the building’s original character." I often find the best way to retain the character of an old building is to convert it into at least 10 flats. I've got a feeling that, in about six years, this "flat-ifying" is going to start to reverse. I can see people buying two or three flats and knocking them together to make a reasonably-sized home. On the scale of EA guff that's pretty bad -- though even worse is when they put up a photo of a local coffee shop. Especially when said coffee shop is 10 miles away. Ah but think about all that fresh air you when you walk there. A real selling point. 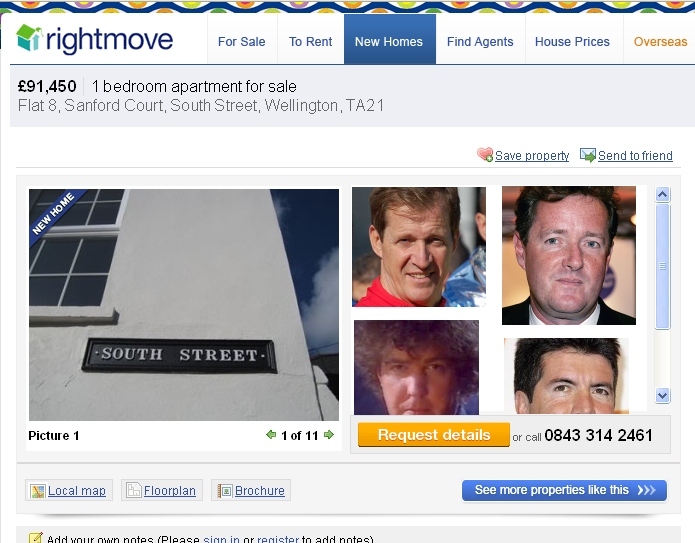 On the same note what relevance does wellington school have to a one bedroom flat? Does little timmy get his own "luxury" apartment with bosch appliances these days? Not a lot. Poor Timmy was never born. - The aerosol was invented in Wellington. Anyone still awake out there?